Moderate drinking has been associated with health benefits, but when you cross the line from moderate to heavy drinking, those benefits are erased and the health risks start to pile up. Understanding how moderate drinking is defined is the first step to understanding whether your drinking is within safe limits or whether you should cut back. There is no single definition for moderate drinking, so it can be difficult to determine whether your drinking falls under that classification. According to the U.S. Centers for Disease Control and Prevention, the Dietary Guidelines for Americans defines a moderate drinking level as one or fewer drinks per day for women and two or fewer drinks per day for men. According to the Linus Pauling Institute at Oregon State University, the U.S. Department of Agriculture adds that moderate drinking in individuals over 65 years old is also defined as one or fewer drinks a day. Heavy drinking can mean anything over these limits, but there is some gray area. 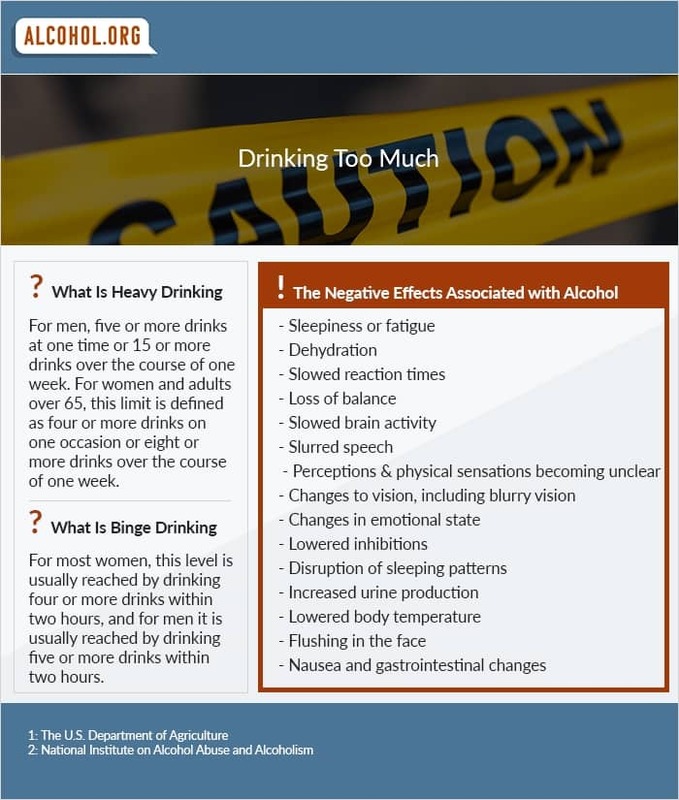 The U.S. Department of Agriculture defines heavy drinking in men as five or more drinks at one time or 15 or more drinks over the course of one week. For women and adults over 65, this limit is defined as four or more drinks on one occasion or eight or more drinks over the course of one week. In general, the typical moderate drinker keeps consumption to the low levels that have been associated with health benefits. A single drink is defined as 14 grams of alcohol, the amount found in about five ounces of wine, 12 ounces of beer, or 1.5 ounces of liquor. Drinking too much can take many different forms, so it can be difficult to assess whether alcohol abuse is a problem. Some people drink infrequently, but binge on alcohol when they do have a drinking session. According to the National Institute on Alcohol Abuse and Alcoholism, binge drinking includes any drinking that brings blood alcohol levels to 0.08 percent or higher. For most women, this level is usually reached by drinking four or more drinks within two hours, and for men it is usually reached by drinking five or more drinks within two hours. Other individuals who cross the line into heavy drinking do not binge drink, but instead drink multiple drinks over the course of a day. Three to four drinks spread out over each 24-hour period is considered heavy drinking, even if the person never gets drunk. Some people who drink too much display signs of alcohol addiction. Alcohol addiction involves strong cravings for alcohol, the inability to limit drinking, and continued alcohol use despite harmful physical or psychological effects. Addicts also may experience withdrawal symptoms when they abstain from drinking and may notice that they start to need more and more alcohol to get the same effects. Both binge drinkers and heavy drinkers may experience a wide range of health problems, including cirrhosis of the liver, an increased risk of some forms of cancer, high blood pressure, pancreatic inflammation, and the development of mental illness. Alcohol abusers may also put themselves and others in harm's way through drinking and driving or may be more prone to accidents such as falls or burns. Some people should not drink alcohol at all, and in these populations even a single drink is considered too much. There is no generally accepted level of moderate drinking defined for these groups. People who should stay away from alcohol entirely include children, adolescents, pregnant women, people with chronic liver disease, and people who are recovering from alcohol addiction or alcohol abuse. In addition to these groups, people who plan to operate heavy machinery or perform hazardous activities and those who are taking certain medications should also abstain from drinking alcohol even at moderate levels. If you are having trouble cutting back on your alcohol use, you might need treatment for alcohol addiction or alcohol abuse. Both inpatient and outpatient treatment is available, and the specific course of treatment depends on your physiology, your level of drinking, and your lifestyle. To find out more about how to decrease your alcohol consumption, or if you are unsure whether your moderate drinking has crossed the line into alcohol abuse or addiction, call us for a free referral.